Diamonds is a card game like no other. You will score Diamond Crystals, not only when you win hands, but also when you cannot follow suit! Each suit has a different ability, so you need to play cards in each suit differently, moving Diamond Crystals from the Supply to your Reserve and into your secure Vault. Be sure to make the most out of your Diamond cards, as these get Diamonds locked into your Vault fastest! Diamonds really are your best friend, as the player with the most points in Diamond Crystals at the end of the game is the winner! 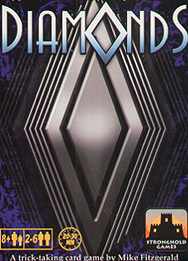 Diamonds is a new classic family card game with great components and stunning art deco styling.